Go from managing single projects to delivering transformational change as part of a programme, with our new virtual MSP Foundation & Practitioner course, which offers all the benefits of a classroom course, but without the travel! ‘Managing Successful Programmes’ (MSP®) represents proven Best Practice programme management and is a framework for successfully delivering large scale, transformational change, through a dossier of related projects and related activities to make the change ‘stick’. The Foundation qualification will provide you with the necessary knowledge and understanding of the MSP guidance to interact effectively with those involved in programme management. 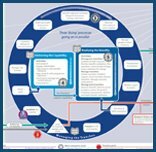 The Practitioner qualification will enable you to apply the MSP framework to your own work and, therefore act as an informed member of a programme management team — someone responsible for managing, leading, supporting or advising on work within an MSP environment. This is an intensive five-day course that prepares you for the MSP Foundation and Practitioner examinations. The training is conducted via a virtual training environment. You need to ensure that you can satisfy the technical requirements that can be found here. In addition, whilst attending your course, there will also be some examination preparation evening work. A concentrated course that requires you to complete mandatory online pre-course study, which is designed to take approximately 6–8hours to complete. Full instructions with a link to the online pre-course will be issued within 48 hours of your confirmed booking. We currently allocate exam time within the virtual classroom event. So that you can book directly, we will advise you of recommended exam timings as part of the candidate guidance — this is issued three weeks prior to course commencement.